A beautiful coat is a sign of health. A healthy doggie coat is supposed to be soft and smooth, according to DogTime. If you're seeing coarse or bristly hair, split ends or greasy hair—well, you have a problem. First step: look at Rufus's diet. He might be lacking certain nutrients that affect hair's health. Omega-3 fatty acids have a number of benefits, including helping with skin issues—which in turn can affect the look and feel of doggie hair. Flaxseed is particularly high in omega-3s. If you have a dog who will eat anything, try adding a teaspoon of ground flaxseed to his food every day. Or try a teaspoon of flaxseed oil for an added touch of flavor and to make dry food more palatable. If flaxseed is a bit too healthy for your dog's taste, you can go with a more flavorful option: fatty fish, which is also high in omega-3s. If you're not ready to buy Rufus some salmon, you can try sardines, flounder or halibut. Or try some fish oil capsules. You can break one open every day and pour the oil directly over his food. Eggs are rich in high-quality protein, which is essential for a healthy, shiny coat. Although you'll find a lot of information about feeding your dog raw eggs, many vets advice against it—uncooked egg contains a certain compound that makes it impossible for a dog's body to digest biotin. So he might end up with a beautiful coat—but suffering from a vitamin deficiency. Cooking the eggs destroys this compound, so you might as well boil or scramble the eggs just to be safe. Then add it to Rufus's food or feed it as a snack. Vitamin A is excellent for hair and skin—in humans and pets alike. Lack of vitamin A can cause flaky skin and hair loss in dogs, according to pebMD. And bad skin almost invariably leads to bad hair—because if the skin doesn't get enough vitamins, how would the hair? For a great source of vitamin A, steam some sliced carrots and feed them as snacks. They're also great low-calorie treats, so they will keep Rufus full without adding too many calories to his diet. 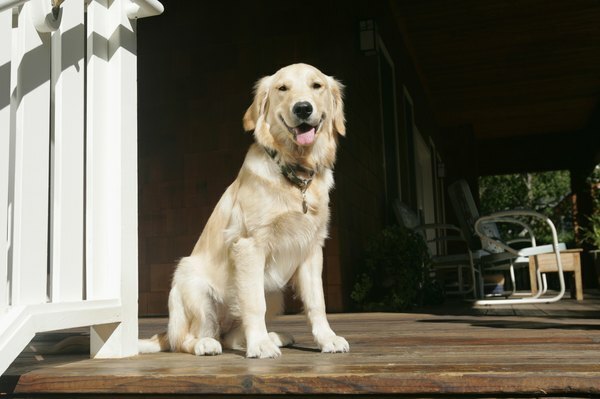 Can Golden Retrievers Lose Hair Because of Dry Skin?